Don't Worry, true believers, there's going to be plenty of Baron Wolfgang von Strucker to go around. It's well known by now that Thomas Kretschmann has been signed up for a brief appearance at the beginning of The Avengers: Age of Ultron as Baron Wolfgang von Strucker. As described so far - von Strucker battles The Avengers in the beginning of the film and mainly serves to introduce Quicksilver and The Scarlet Witch - the part sounds more like an easter egg for Marvel superfans than a character with lasting impact on the Marvel Cinematic Universe. But au contraire im Gegenteil, meine Freunde! It turns out Marvel has big plans for the Baron. "I have a multi-picture deal which means I will not only appear in the 2nd part," Kretschmann said in an interview with B.Z. Berlin, "but they're planning with me for a longer period of time. But I don't know details yet, they're keeping their cards close to their chest - top secret!" This could mean absolutely nothing, of course. Marvel may simply have wanted to lock him down to future pictures just in case. But given the trajectory of the Marvel Cinematic Universe so far, it feels quite likely we'll see much more of the character than a cameo in Avengers 2. In the comics, Baron von Strucker starts out as a high ranking Nazi and the Red Skull's right hand man. After World War II and the apparent death of Red Skull, Strucker escapes postwar justice and, thanks to injections of an age-retarding serum, he serves as leader of the HYDRA organization and as an evil counterpart to Nick Fury throughout several incarnations of Marvel continuity. 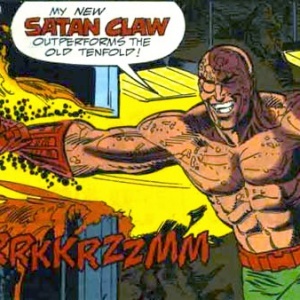 And just in case the fact that he's evil isn't clear, he favors a monocle, and his weapon of choice is a glove called "the Satan Claw." This presents the interesting possibility that HYDRA is being developed as a foil for S.H.I.E.L.D. in Marvel Phase 3. Strucker didn't appear in Captain America: The First Avenger, and so far the Marvel films haven't spent much time using the events of that film as anything other than backstory. But characters from that film play a huge part in Captain America: The Winter Soldier (surely we all know by now who the Winter Soldier is, right?). Further, rumors that S.H.I.E.L.D. is disbanded during the events of CA:TWS, not to mention the fact that trailers for the film have already "spoiled" the possibility that Nick Fury dies during the film, should be enough to assume big plans. If The Winter Soldier is around, it's not much of a stretch to imagine that more of Cap's WWII-era enemies are waiting to poke their heads into the modern world. My guess is that at minimum, von Strucker's agelessness turns out to be the result, like so much in the MCU, of experiments like the one that created Captain America's super soldier serum. I'm also willing to bet that with the MCU clearly leading toward the Infinity Gauntlet storyline as its climax, establishing HYDRA as a credible threat paves the way for the organization to ally with Thanos in some capacity, similar to how Loki did in the first Avengers film. We will see in good time. What do you think, readers? Let's wildly speculate in comments, shall we?